Here’s my take on this issue after helping people with it for 7 years. Since I started my work in 2011, I’ve been in touch with thousands of people from around the world. I’ve heard many heartbreaking stories and over time, certain patterns emerged. Those that kept working on their pain, even during hard times, eventually got better. Being stubborn paid off, always. Second, healing progress is almost never linear. That’s why it’s so frustrating and disheartening at times. Some people get better quickly at first, but then have to fight and claw their way from being, say, 80% pain-free to being 100% pain-free. Some already struggle with the first little bit of progress, the first 10%. They can’t even find a way to get started. Then there’s the healing plateau. You get better to a certain point, but that’s where you’ve been stuck for months. The healing process is a rollercoaster mix of all these twists and turns, with the occasional setback thrown in for good measure. It’s normal to get frustrated. It’s normal to be disheartened. But if you keep working on the pain in a smart way, you will get better. It’s just a question of time and using a sophisticated approach. Here’s how you can do it. My philosophy is that pain always has at least one root cause. To get better permanently, we need to find it and fix it. There is no magic pill (or injection) to get better. There’s only hard work. Depending on what type of chronic knee pain you have, the approach will vary in the way you need to strengthen the knee, but these first two steps are always part of the process (NB: This does not apply for acute injuries such as tears, sprains, fractures, etc., go to a doctor immediately!). It sounds so obvious, yet, how many of us hesitate when it comes down to doing it. 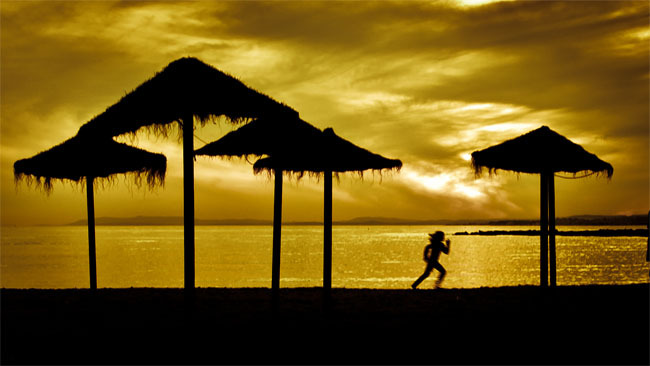 If you love running, you want to keep running. If you love playing basketball, you want to keep playing. I know I did. We don’t want to put enjoying our life on hold, just because of knee pain, but unfortunately, it’s necessary to calm the painful tissue down. I like to put it bluntly with the following analogy. Sure, you can do that, but eventually you’ll realize that stopping overuse is the only way to get better permanently. Sometimes this realization needs to mature over months, maybe even years, before people are willing to accept it. You need to help your body move in a way that puts as little stress as possible on the knee during your sport. Improving your biomechanics will do that. This includes foam-rolling, working on muscular imbalances, and consciously improving alignment of your legs. 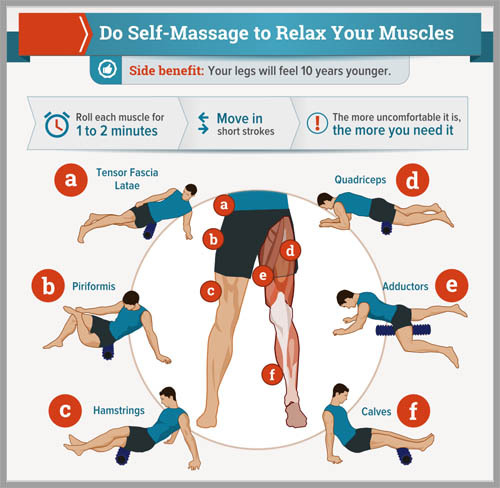 Self-massage exercises for knee pain. This step requires a variety of different exercises. You can find the most important ones in this infographic. There are many more, but this will get you started. At this point, you’re at a fork in the road. Depending on what type of knee injury you have, you will need to take a different approach. Here’s how you can strengthen the painful tissues for two common situations. Excess tension in the muscles on the outer side of the leg plays a role in both conditions. In IT band pain, it leads to higher pressure on parts of the IT band, irritating the tissue over time. The discomfort will be on the outer side of the knee. In medial knee pain, usually the culprit is increased tension on the structures that pull the knee towards the midline of the body to hold the kneecap in place. This leads to pain on the inner side of the knee. Here are two basic steps you can take to begin fixing it. The first step to massage the calves (peroneals), outer side of the legs (vastus medialis, IT band) and the hips (gluteus medius, gluteus maximus, TFL) very thoroughly to release tension from the painful tissue. Next, look for weak muscles in the legs and strengthen them. Usually this will be the gluteal muscles in the hip, but it can also be other leg muscles. You can use the exercises in step #3 here. With knee tendonitis, your goal is to strengthen the painful tendon through slow resistance training, while avoiding flare-ups. The tricky part is that you need to use high resistance for the tendon to become more resilient, but you need to avoid using too much resistance, because that may cause a flare-up. Here are three guidelines you can use to avoid irritation. When it comes to tendon irritation, holding a weight under tension (isometric) is safer than moving a weight (isotonic). So holding a weight in the leg press is safer than moving it around. If your tendon is sensitive, start with isometric holds, like simple wall sits. 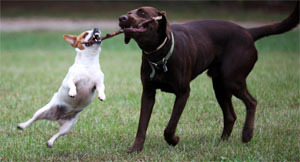 You can also use any other resistance exercise and hold the weight in place. The knee angle increases the more you bend your knees. If your knees are straight, the angle is zero degrees. If you’re sitting on a chair and have your feet flat on the ground, it’s about a 90-degree knee angle. The safest knee range of motion to avoid irritation is between almost 0 and 60 degrees. With a higher knee angle, tendon compression increases. You can do more range of motion as your discomfort goes down. Jumping, running, and other explosive movements are different from slow weight bearing movements primarily in that they store energy inside the patellar tendon, which the tendon then releases again. This energy storage can easily aggravate your tendon, if you already have a history of tendonitis. You should only transition back into explosive movements once you can move very high weights in the slow strengthening exercises. 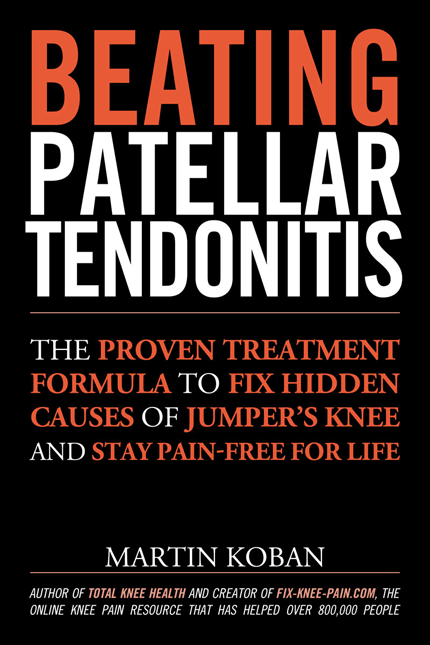 If you want to learn more about this injury, check out my ultimate guide on curing patellar tendonitis. In my experience, once you’ve found a training regimen that makes your knee pain feel better, you’ve already done 50% of the work. You’ve managed to get your foot in the door and you’re half-way to the finish line. All you need next is the patience to keep doing what you know works to get significantly better. Unfortunately, most folks underestimate the amount of time and effort it takes to get back to 100%. If you only do a couple of exercises now and then over just a few weeks, pain will likely come back. 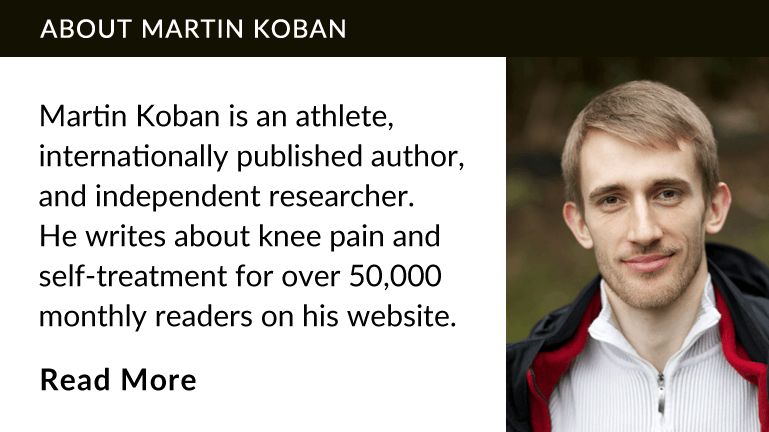 If you’re stuck and need help with a systematic approach, my Total Knee Health course could be a good fit for you. I will tell you more about it next week.